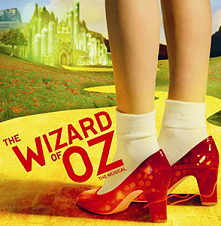 The Tybee Arts Performing Society (TAPS) goes the full tornado with 'The Wizard of Oz' for the next Tybee Island Event. The show opens today July 22 at 7:30PM with additional evening performances on July 23, 29 & 30. Sunday matinees at 3:00PM will be on July 24 & 31. Admission is $20 adults (non-association members), $12 children age 12 and under and $18 for Tybee Arts Association member. Tybee Arts Performing Society produces several plays a year. Performances are occasionally staged at the Tybee Gymnasium. TAPS directors and actors also offer workshops to the public, and a summer children's camp. This and many other fun and exciting events can be found on Romantic Inns’ Savannah Events Calendar. Make your reservations today in beautiful Savannah and enjoy all that it has to offer. The Tybee Island Wedding Chapel, a Premier Wedding Venue for your destination beach wedding awaits to host your special event in their elegant and romantic setting. 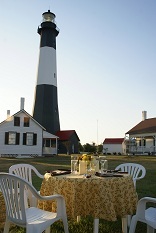 Tybee Island Wedding Chapel and Oceanfront Cottage Rentals officially opened the Tybee Island Wedding Chapel June 24, 2011. The chapel, once a cinematic landmark, repurposed as an elegant destination wedding and special event venue located on a wooded lot just seconds from the beautiful sandy beach. The wedding chapel was recently renovated to accommodate wedding events and features a bridal parlor, groom's dressing room, classic pews or chiavari chairs, state-of-the-art sound and lighting system, a baby grand piano, full caterer's kitchen and enough tables for 150 festive guests that will be enjoying a delicious coastal cuisine and charming oceanfront accommodations in one of the rental cottages or nearby hotels. "We're delighted to bring a romantic new wedding venue to Tybee Island," said Stacye Jarrell, owner and founder of Tybee Island Wedding Chapel and Oceanfront Cottage Rentals. "The chapel is a beautiful venue visitors and event professionals can choose when they decide to make Tybee Island their event destination." 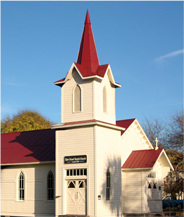 Since its soft opening in April 2011, the Tybee Island Wedding Chapel has booked over 50 weddings and it is already receiving many high marks, including upcoming features in The Knot and Wedding Magazine. "It was a moment of pure chance when I decided to acquire the chapel for an event venue," said Jarrell. "The idea was to help further opportunity on the island and remind our regional beach-lovers that Tybee Island is the perfect setting for their destination wedding." For more information about the Tybee Island Wedding Chapel or to arrange a site visit or tour, please visit Tybee Wedding Chapel or call 912-786-0054 or 800-786-5889. Oyster Roasts, Arts and Crafts and Folk Music are all part of a very special tradition in Savannah that take place on the First Friday and First Saturday of each month. These are all family friendly events and there is something for everyone. 'First Friday Oyster Roast & Fireworks' are at the Westin Savannah Harbor Golf Resort & Spa every First Friday. People enjoy live entertainment, dancing, plus what the night is famous for- buckets and buckets of oysters. There are also other tasty grill items to enjoy for those not interested in the shellfish morsels and a full bar. The evening is capped off with a fireworks show that is always a crowd pleaser. It all begins at 7pm and concludes at 10pm. 'First Friday for Folk Music' is Savannah's monthly showcase for local and nationally acclaimed folk music talent. It all starts at 7:30pm on the First Friday of each month at the First Presbyterian Church located at 520 Washington Avenue. All shows are non-smoking, non-alcohol and family friendly with baked cookies and beverages available at nominal cost. Suggested donation for the concert is $2. 'First Saturday on the River' is a plaza full of great artisans unique one-of-a-kind works ranging from simple crafts to exquisite fine art. Plus you can sample Repicci’s Italian ices, Savannah Popcorn’s kettle corn, cold beverages and much more as you amble along Rousakis Riverfront Plaza on Historic River Street. Historic Tybee Island Light Station and Museum of Tybee Is. Historic Tybee Island Light Station and Museum of Tybee Is. is one of many awe-inspiring sites to see on a tour of Tybee Island. First ordered by Gen. James Oglethorpe in 1732 this lightouse is one of America's most intact left with all of its historic support buildings on its own five acre site. Rebuilt several times the current light station display's its distinct 1916 day mark with 178 stairs to the magnificent 9 foot tall First Order Fresnel lens, this beacon of light continues to guide mariners safely into the Savannah River as it has done for over 270 years. Under the management of Station Keeper Cullen Chambers and his staff, they keep the Tybee Island Light Station as one of North America's most beautiful Maritime museums in use. Whether it is for business or pleasure, give one of our Savannah Inns a call or book online one of our many beautiful guest room in historic Savannah Georgia. Happy 4th of July!